The music player you use in Animal Crossing will impact the song it plays. Older ones will sound scratchy and cheap ones will sound tinny. Some will even have different levels of bass and treble. Try the same song with different music players and you'll see what I mean! Building on this, I like in level-based games when one level leads clearly into the next one, like if the exit shows off a preview of the following level, or if the beginning of one level is the same area as the exit from the previous one, etc. This crops up a lot in Duke Nukem 3D, and it helps it feel like you're progressing from one adjacent area to the next. I like how you can see the Tower of Babel slowly being constructed as you progress through Doom's second episode. I like the way MOTHER 1's melody is so simple. Or better, how all its songs is simple. Proof that good games do not need Mozart-esque soundtrack. I like how Luigi's Mansion has a button just to make Luigi cry out to Mario. I like (but actually hate) that if you take a talent like "Smaller, Lighter, Faster" in Borderlands 2, if you get a gun with a magazine size of originally 1, it might actually just be a size of 0 after talents. You can't fire it. Enjoy your paperweight. On top of that, I like how Luigi's cries become more desperate and terrified as his health drops. I like enemy colour-speech. It promotes immersion. Noticed it a ton in COD2 on the 360, boy--------the ratzis would taunt you a lot. Actually helped a little---------hear someone shout 'ein Geschenk von dem deutschen Armee! ', you knew a grenade was coming. Also sometimes it's just weird and funny. In 'Armed and Dangerous', you'd occasionally get bizarre death-screams. First mission and first mission only, a randomised enemy, once defeated, would yell, 'there's a bullet-hole in me arse! me poor, beautiful arse!' 'Armed and Dangerous' was pretty odd, man. In MGS V, the more people you kill the bigger the shrapnel stuck in Big Boss's head gets, making him look more and more like a demon. 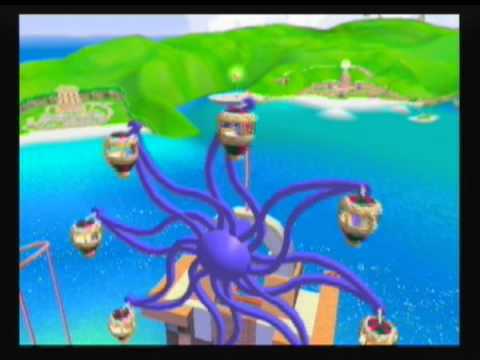 I love that you can see other parts of Isle Delfino in the distance in Super Mario Sunshine. It really makes it feel like everything's taking place on one big island, as opposed to the disconnected realms of Super Mario 64. I loved this little moment when I started Yoshi's Woolly World. During the opening cutscene when Kamek turns all the Yoshis into yarn and takes them away in his bag, somehow I think the brief act of Yoshi trying to hang on to the bag and pull it back down as Kamek was flying away added a lot. For one, it's hilariously adorable seeing Yoshi using his little arms to hold on while doing his "HHMMHHMMM" noise, but I also like the fact that Yoshi immediately jumped to action and put all his effort in trying to stop Kamek before his adventure had even started. It shows how tenacious and unhesitating he is. Unlike whenever Bowser kidnaps Peach, and Mario just stands and watches helplessly until he gets blasted away or something. I'm probably reading way too much into the character of the protagonist of a Nintendo sidescroller. 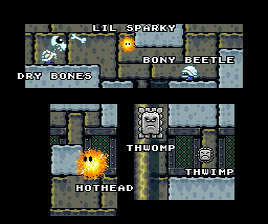 I like games that have a curtain call at the end, naming all of the characters and creatures encountered in the story. Super Mario Bros. 2, Super Mario World, Banjo-Kazooie and Cave Story are a few that come to mind. ^ Mega Man and Shovel Knight do it. I feel like it is a Platformer thing for some reason. So, like, back on the PS2, your game saves would go on a memory card. And, like, when you were managing your game saves, they'd be represented onscreen with goony little 3D models pertinent to the game--------a logo, a character, sometimes even an animated thing. If you went to 'delete', the model would change in some games. 'Adventures of Cookie and Cream' had a potted flower for a model; switching to delete would show the flower fallen over and dead. 'Okage' would change the demon-lord from standing up normally to bein all slumped over, arm stretched out in supplication. 'Okami's normal model was of Issun the sprite bouncing up and down-------switching to 'delete' would change Issun red and have it bounce faster, the way it did in-game when agitated. I know there were others. Cute, silly and clever. I like how Chrono Trigger has two boss themes: the regular one you hear in most boss fights, and a more tense, dramatic one you hear during major boss fights. The occurrence of the second theme makes the major boss fights feel even more special and pivotal to the plot. I like how Colette will name all of the dogs you talk to in Tales of Symphonia. You even get a title for her if you name every single dog in both worlds. Along the same vein, I LOVE how in Twilight Princess you can play fetch with the dogs and when Link picks up dogs and cats he holds them gently in a hug. FINALLY a game that lets me hold virtual dogs and cats the way I want to??? In Pokemon Omega Ruby/Alpha Sapphire, there is an underwater Dive section where the camera angle changes to a more side-facing view. In that view, you see a crevice, and if you wait just a second, a bunch of Corsola will bop along in front of you through the crevice. The 4th or 5th Corsola, looks at you, bounces around a little, and then hurries off to catch up with its buddies. It was adorable, it made me smile, and it's one of those little details that makes the game come to life. ^^ ORAS HAD SSSOOOOOO MUCH STUFF LIKE THAT!!!!!! Like how you can do loop de loops and dives while soaring on Latios/Latias and how the underwater overworld has luvdisc hanging out and. I really love just playing that game and diving/soaring/otherwise interacting with the overworld bc there's so much cute fun stuff about it. Speakin of Pokemon. Can we talk about Gen IV's little things?